Heh, I guess I'm in trouble. but I personally feel that a team of gifted, fast youngsters beating wily, relatively more ponderous veterans (in the final third particularly) was good for the game. The great thing about football is that it is not rugby or the Olympics. In football it's less about being fast and more about letting the ball do the work. France didn't want the ball in most of their matches. It's a bit depressing really. Football goes in waves. Spain in 2010 was the peak of wanting the ball. They went too far in that, in many ways. Now Deschamps devised a new system to counter tiki-taka. It seems to involve not wanting the ball at all. I don't think it will last too long. Croatia (and to a lesser extent, Argentina) exposed all of France's weaknesses. Croatia, to me, represented a nice balance between Spain's possession for the sake of possession and France's set piece football. You missed out 2006, when he dragged them to the final. Euro 2000 can't just be waved through in one sentence. He was phenomenal there, as was the team. Drugs, I agree, but How clean were Man U? Oh he was great in Euro 2000, and he was great in the 2006 world cup, There's no denying his enormous talent, but that's just two really important months in his career. The 2006 world cup came after three pretty unimpressive seasons at club level. That's not how players are judged nowadays. It would be very difficult for a player to establish the level of reputation or acclaim that zidane did, so much on the basis of two and a bit good international tournaments, and surprisingly few good years in club football. The relative importance of the two is so completely reversed now. I'd say man utd were pretty much completely clean until at least 2000. It took them about that long to stop drinking, and there's no point before that. I'd look at the Appointment of this guy with a certain level of suspicion. And I think that there are questions around carlos quierroz's sacking by portugal that need answering. Look at it this way. There are four basic reasons why clubs/ players dope. The thing is that English only gave up on heavy boozing around 2000 so there was no point before that. Then clubs primarily select players based on their athleticism first and foremost, so that rules out a) Then under ferguson Man utd hardly ever bought a player over 25, rotated a lot from early on, and players got less athletic and more injury prone over time, broadly as you'd expect. So there's not really any of the tell tale signs. But as for players returning from injury, that's really an unknowable, as you don't know how badly injured a player was. I would say though that if a Man utd player was coming back from injury, it was usually pretty easy to tell. though I point you back to my earlier suspicions. But it's very difficult to look at the raw numbers for distance covered by footballers in general since 2000, and particularly around the 2006-2010 period without looking askance at the entire sport. The increase in physical output by every player on the pitch is pretty extraordinary. I wonder what we're going to find out eventually about a lot of the biggest stars at this most recent tournament. Last edited by The Awesome Berbaslug!!! ; 17-07-2018, 15:53. Incidentally, why can't the VAR whisper in the ref's ear that Griezmann dived, and have the ref review it? Would have been a yellow card for Griezman and free kick for Croatia. The argument would obviously be that we'd be reviewing things all day long. That would be the case in the beginning, of course, but once people understand that diving is finished, they'd stop doing it. And the game would be better for it. As it stands, we had VAR in the world cup final, and diving still delivered a world cup trophy. If there was no VAR, Griezman would have gotten the dodgy free kick but Croatia would have gotten a goal kick for Perisic's handball. The two situations would have cancelled each other out. As it stands, VAR has made things more unfair in this particular match. The penalty call was 50/50. If France were Ireland, I'd have been screaming for it. If Croatia were Ireland, I'd be arguing it was accidental and non-consequential. Just gone back to look at the Griezman dive for the first time. He's clearly launched himself before contact is made. So yeah, if that free-kick is not given and Croatia end up being the team that goes 1-0 up, then you have a different ball game altogether. The flow of the second half was a direct consequence of the first half, so France's second half goals are kind of irrelevant to whether Croatia wuz robbed or not. I'd feel a bit more aggrieved about the free kick if brozevic didn't just plough into him while he was still in mid air. If he hadn't dived for a free kick, he was about to get one. a team as wed to canny tactical fouling as croatia can't complain if a canny tactical forward like griezmann does something like this. It's merely the flipside of the same coin. edit: On a side note, loving the gallery of Olympique legends displayed as you scroll through the text of their club history on wikipedia. Last edited by anton pulisov; 17-07-2018, 15:58.
modric only covered about 10km a game, which isn't really all that much. particularly given that half those games went to extra time. There was a lot less running about in the england croatia game than you'd think. Croatia covered 89km, and england covered 92km, over 120 minutes. That's a lot less than you'd see in most club games in most leagues. The most important part they need to sort with VAR right now is for it to not affect the ref's authority and not allow ref's to use it as a way to escape from responsibility. If more power is given to the VAR room, what use will there be for linesmen in a near future when the ref can just get a blip in his ear from the control room? For very tense moments, why would the ref take any responsibility in the end? He could simply refer to VAR at any given moment when it's supposed to be used no matter how sure he is what the decision should be, ahead of calling on VAR. There will always be one team who questions the decision, no matter what. It could become a scenario where some ref's use it all the time and when the players come complaining he can simply point to a bunch of chaps sat in a secret chamber the players can't start chasing. One thing with VAR, it certainly escalated this WC with players gathering around the ref demanding the decision goes their way. I've never seen as many games with clusters of players around the ref so many times. Yet at the same time, once there is a VAR decisions, they instantly calm down and stop complaining. But they do need to start giving yellow for that bloody sign the players learned to make in the air. I would give Deschamps a little bit of credit for the 2nd half on Sunday. The first 15 minutes saw France pinned back and the usually brilliant Kante being overrun, making him look really off the boil. Deschamps didn't perservere with him, he hooked arguably his most important player in the tournament and put on N'Zonzi. After that, Croatia found it harder to get through and France began to emerge on the counter. Kante picked up an early yellow card, that made him a prime candidate to be subbed, especially given his role on the pitch. I think it was discussed earlier, somewhere else. I forget the outcome, but apparently it's all a big misunderstanding and similar to singing a song that isn't about slaughtering Serbs as sung by other nations. I think. 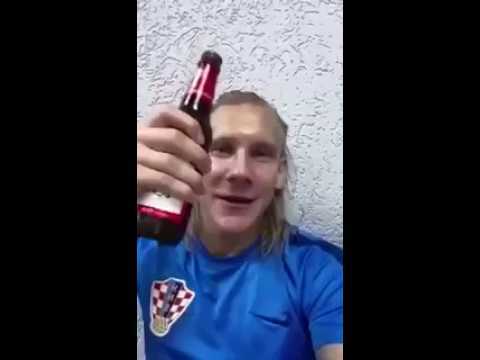 Vida singing about Belgrade burning was a bad look as well. It's too bad they can't put that nationalist tribal sectarianism behind them, maybe in a decade or two things will get better on that front. Last edited by linus; 17-07-2018, 18:45. If we're to call this cool, and fresh, and praise them, we might as well aim for EIM's possible dream where the World Cup 2022 is being played in Bullwell, not a ball being kicked a single time, instead 22 people clad in pink balaclava meet up on the pitch to see who can throw a biscuit the furthest and VAR is brought in to decide what's actually a proper biscuit and what isn't while the England band play Oasis songs on xylophones in the background. Excellent. Which country would be most likely to show up with Jaffa Cakes?